My son's first fountain pen! My son started kindergarten this week and is starting to practice the basics of writing. So of course he needed his first fountain pen. 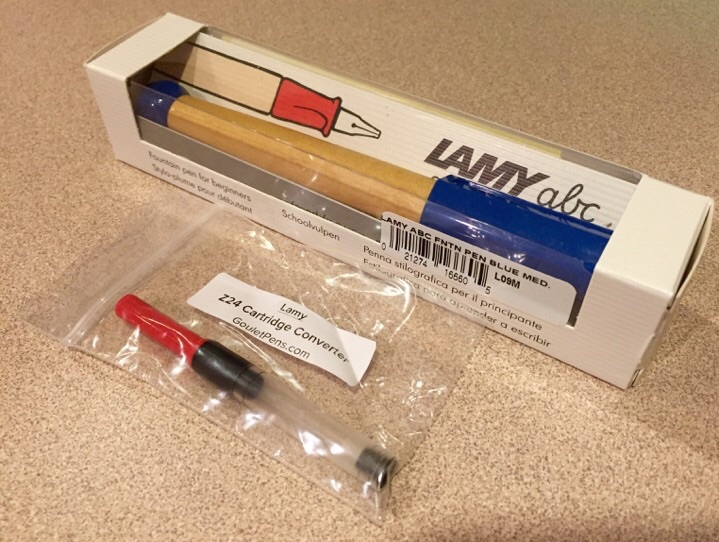 Today his LAMY abc pen arrived. 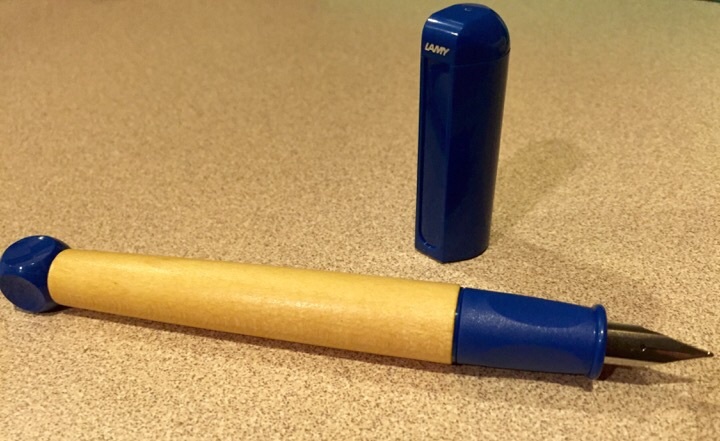 It is blue and is fitted with a medium nib. I have inked it with Noodler's Bernanke Blue. A writing sample picture will be added tomorrow once I get home from continuing education classes and can take a picture of his writing lesson. Wow, I had to learn with a nib and nib holder at that age. We'd dip out pens into the bottle of ink that set in the round hole in our desk. The teacher would give us a new nib and fill up our bottle every Monday. I would have loved that Lamy. Very nice !! I remembered the days when fountain pen was a must use for annual academic exams. The fountain pen was mandatory at the age of 10. Obviously I am giving an example of an overseas country. I don't know the age of your kid but sounds like a great idea to introduced to fountain pen. Brian, you're starting your son off right. Here's hoping he enjoys a lifetime love affair with fountain pens, as well as wet shaving. Heaven knows, he has the best dad to show him the way. Very cool! You're planting a great seed there. (08-13-2015, 09:12 PM)evnpar Wrote: Wow, I had to learn with a nib and nib holder at that age. We'd dip out pens into the bottle of ink that set in the round hole in our desk. The teacher would give us a new nib and fill up our bottle every Monday. I would have loved that Lamy. Me too. We had to use dip pens all through primary school, but whe we moved into secondary school we had to use a fountain pen for all our work; no ballpoints, no pencils ever. To this day I still use a fountain pen and own over a 100. Sharpspine, good to know your'e starting him off on the right foot. My son also has a Lamy and it has helped his penmanship alot. Regarding dip pens that other people have referred to, back at the dawn of time I was into the French and Indian war and Mountain Man blackpowder rendevouz periods. Making my own powder horns and quill pens from goose quills. I showed my son how to shape and split the quill and dip in the ink and write. Dad, you have to keep dipping it, shake it off and it takes awhile to write anything, he says. Yes, yes it is slower, but look at the penmanship of these old timers. Your son will have better penmanship than his peers if he stays with the FP. Too many people just scribble something. I mean your penmanship reflects on you. Hopefully his penmanship will reach the level of freddys'. That's is just so cool! So where is the photo, Brian? (08-17-2015, 10:38 AM)freddy Wrote: So where is the photo, Brian? I am thinking about starting daughter to use my montblanc's . Any idea where I can Find writing books for practice ? Whoa! Some more information, please. How old is your daughter? How much experience does she have using a fountain pen? Are you talking about practice with printing or cursive writing? There are many books available at Amazon http://www.amazon.com/s/ref=nb_sb_noss_1...g+workbook as well as many free worksheets on the internet that can be printed out https://duckduckgo.com/?q=penmanship+pra...eets&t=osx. You will notice, when looking at some of these books/worksheets, that writing styles can vary. On a personal level, some I like and some I do not care for. For example, I have never cared for the D'Nealian style. However, that is just me. What is important is that all of these styles are clear and easy to read. Just to refresh, how old is your daughter, what is her writing experience so far, and what types of writing material is she most familiar with? I sincerely hope this helps somewhat and that your daughter will soon be on the way to great writing experiences.
" I'm still here you bast****" as is my watch and pen. That pen is really neat! Fantastic pen. Great job on finding that Lamy.